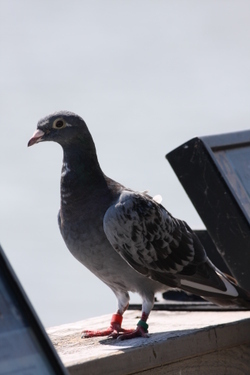 The last we saw of the racing pigeon was last Friday, but we did get a call from the secretary of the local pigeon racing association. He said that this pigeon-racing season, and the pigeon who hung out at deKorte Park for a couple of days last week was probably just taking a prolonged pit stop because he was exhausted. His advice to anyone who sees a racing pigeon just hanging around: Make sure it has a good source of fresh water.